In the assortment of PoloDent and Yellow Point you will only find high-quality products. The full range of products developed by us are displayed on this website. There are continuously ongoing developments and test procedures to extend our assortment substantially. Each package has been completed with a barcode. All details are also clearly visible when the packages are piled up in your storage. If significant, you will also find information concerning the use and the usability of the product on the outside of the packaging. By use of the barcodes it’s easier to order these products and write them off from stock. All of our products are of the highest quality and are delivered to you directly, without any interference of agents, importers or such. Therefore these products are prise-wise at a very attractive level. By using PoloDent and Yellow Point products you can save considerably on your expenses of dental products. We gladly invite you to get aquainted with the product ranges of PoloDent and Yellow Point by means of this online catalogue and since we are receptive to improvements we always appreciate your suggestions and remarks concerning the products and/or range of products. If you use our products you can be sure you are using the best products! 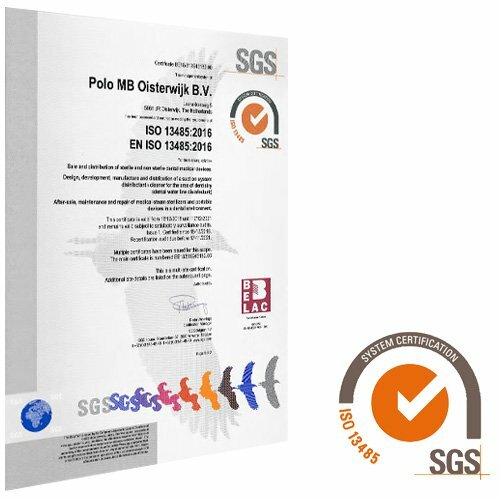 We have obtained the ISO 13485: 2016 certificate. This certificate ensures that our quality management system meets the most stringent and latest standards regarding medical devices.